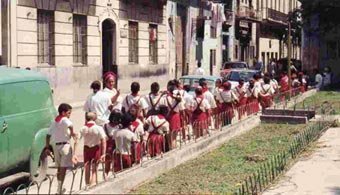 Also visit our page on education in Cuba as part of social control. Sebastian Arcos Cazabon is an ex-political prisioner and member of the Cuban Committee for Human Rights. He lives in exile in Miami and is director of Latin community Relations of The Florida International University. 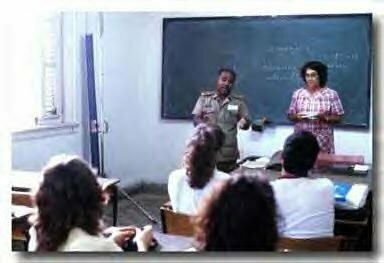 If you ask any defender of the "Cuban Revolution" to identify those rights which are respected in Cuba, he is sure to begin by saying: "Education is free and open to all in Cuba." Just how true is this assertion? 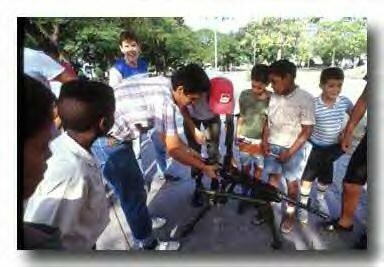 Certainly, no Cuban living on the island has to spend anything on his own education or on that of his children; accordingly, university entrance depends solely on the student’s qualifications, and as a result, anyone, regardless of his economic or social position, is able to obtain a degree. Superficially, that is so; however, is something free merely because we are not charged hard cash for it? 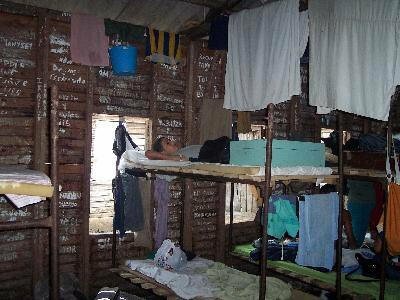 Is it really true that any Cuban may attend university? First of all, let us examine the notion of "free". From the time a young person reaches seventh grade and until he completes twelfth grade he is required to spend 30 days each year working on the land. Until recently the period was 45 days for pre—university students. If the student is the recipient of a grant at a Rural Basic Secondary School (ESBEC), then he faces a double working day, during the morning in the fields, and during the evening in class, or vice-versa. In neither case is he paid in cash as might be expected, and any student who does not carry out his work in the fields is simply barred from going to university. As if this were not enough, at the beginning of his first year the would—be doctor is required to take an "oath of unconditional support for the Revolution" and for its principles. The word "unconditional" puts things in a nutshell: you qualify as a doctor, but you have to do whatever the "Revolution" decides. While other disciplines do not go so far as to require an oath, everybody is aware of the commitment he takes on, and if anyone refuses to do his "social service", a period of some three years work carried out by the graduate wherever he is sent (almost invariably to a distant province) his degree is withdrawn, and he is thus prevented from exercising his profession. It may seem only fair to reimburse the State in this way for its investment in the professional’s training, but it is not; not when the student is offered an education "free" as a "generous concession by the Revolution", and above all when he has no choice between a free and a fee-paying education. He is only offered the "free" education — accept it and take the consequences. 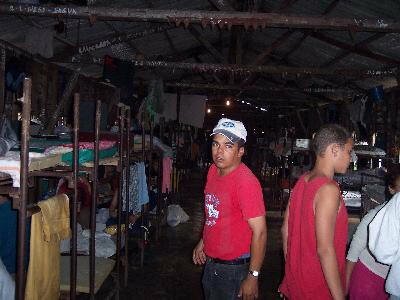 Furthermore, it is common knowledge that, in order to be able to leave the country, thousands of Cubans have had to pay in hard cash for the training they have completed (natura1ly, those who pay are their relations abroad, and in United States dollars) , because the State refuses to allow those who have received "free" professional training to leave the country. Let us now examine whether university entry is open to all Cubans. The present writer was dishonourably expelled from the University of Havana for having attempted to illegally leave the country with all of his family. His sister, a second—year student at the Higher Institute for the Teaching of Foreign Languages (ISPLE) suffered the same fate. Following the events of 1980, a campaign was unleashed under the slogan "The University for Revolutionaries". Anybody could be expelled if he did not maintain "an attitude in keeping with the principles of the Revolution". Failure to attend the activities of the Federation of University Students (FEU) which are almost exclusively political, failure to stand guard at the Faculty, lack of a "combative attitude towards inefficiency", expressing opinions which are "not in keeping with those expected of a young revolutionary", practicing any form of religion, and even a preference for Western music, fashion or other products, are examples of such unacceptable attitudes. Any of these pretexts may still be used, although not with the vehemence which was customary at that time. Currently, in order to enter university, students are required to pass an entry examination to show they possess the basic knowledge required. 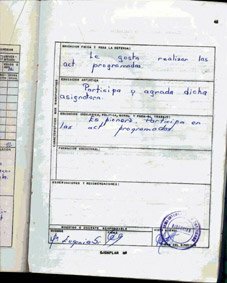 In order to take this examination students need a letter from the Committee for the Defense of the Revolution vouching for their "political and moral background". I am familiar with the case of one person who was unable to take the examinations because the letter from by his Committee for the Defense of the Revolution stated that he "had friendly relations with elements who wished to leave the country". So far we have considered matters covered by paragraph 1 of article 26 of the Universal Declaration of Human Rights. Let us now look at paragraph 2. From early childhood Cubans are taught to hate everything connected with the United States. Universal history is falsified and reduced to a question of "good guys and bad guys", in which, naturally, the "good guys" are always the communist countries and the "bad guys" are always the capitalist countries. They are taught that religion is "the opium of the people" and that those who believe in God are simply ignorant. Politicization is pushed to an extreme; schoolchildren are taught Marxism from the eleventh grade. Political courses are part of all studies, and students are assessed in them as In any other subject: dialectical and historical materialism, political economy, scientific communism and the history of the workers’ movement. Military training is also given to students in all years, and at the end of their studies there is the so-called "intensive military course", which lasts between 15 and 45 days. In contrast, no mention is made of human rights, unless it is to assert that they are violated by the capitalist countries and observed by the communist countries; the Universal Declaration of Human Rights is neither taught nor mentioned at any level of education in Cuba. 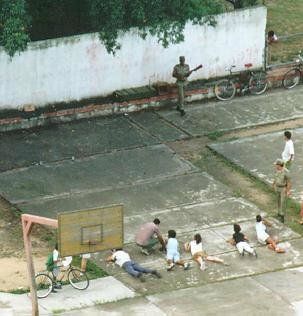 With regard to the third and last paragraph of article 26, it has to be stated that in Cuba the only type of education offered is that provided by the State. Once again, Cubans have no choice.